I am super excited to have the opportunity to premiere the second single from East Nashville's own Erica Blinn's forthcoming album, Better Than Gold. "Dance with the One (Who Brought You Here)" was co-written by Blinn and Kristopher Michael Phillips (aka K Phillips - his first Nashville co-write). "Dance With The One (Who Brought You Here)" came from an afternoon-turned-evening session with Erica's then roommate singer/songwriter K Phillips in which a first draft was pounded out on one of K's vintage typewriters. "When we recorded Dance With the one (who brought you here) we knew we wanted to start by creating a percussion track. we had been digging the percussion on the song 'honey pie' [Jonathan Tyler], and we'd been listening to the album 'High on tulsa heat' [john moreland], which has some incredible percussion, and of course our favorite Todd May song 'Better way to build a rocket' which features a killer clave track. We actually bought a pair of claves just for this song." 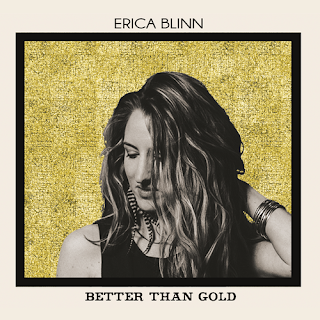 The song is a short, snappy rock song - propelled by Blinn's rich, sultry vocals and her blistering harmonica work. She is backed by a powerhouse band featuring: PJ Schreiner: drums, percussion, backing vocal, Wade Cofer: bass, electric guitar, backing vocal, and Andrew Leahey: lead guitar, backing vocal. The song (and forthcoming album) is produced by a long-time friend and fan Mike Landolt (O.A.R., Maroon 5). No release date has been set for Better Than Gold, but with tastes like this song and the first single "Softer Side", it cannot come soon enough for me. Anything K Phillips touches is gold.